Happy Valentine’s Day! What? You were expecting something from Victoria’s Secret? I’m keeping my tri blog strictly PG. But this seemed like a good day to bring out one of my favorite holiday gifts from my sister — a Boston Marathon sports bra. She knows what my heart desires — a qualifying time for Hopkington. After watching a handful of special people with the guts to train for Ironman and half-Ironman races, I’m inspired to really give it a go. We grew up in a suburb of Boston and spent many Patriots Days cheering on passing runners. When I was younger, I used to train with the BAA track club. I even turned down a comp number because I wanted to qualify for it. 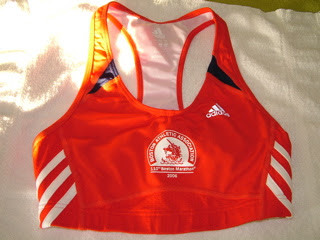 So after a life-long love affair with the Boston Marathon, I’m finally ready to commit.